BACKGROUND: Globally, 90% of road traffic crash (RTC) deaths occur in low- and middle-income countries. OBJECTIVE: To document the mortality and morbidity associated with RTCs managed at a busy regional hospital in South Africa and investigate potentially preventable factors associated with RTCs. METHODS: This was a prospective study of all patients presenting to Edendale Hospital following a RTC over a 10-week period from late 2011 to early 2012. All fatalities recorded at the police mortuary for the same period were included. Medical records were reviewed and all admitted patients were interviewed about the circumstances of the accident. We calculated an injury pyramid to compare our data with European data. RESULTS: A total of 305 patients were seen over the study period, 100 required admission and there were 45 deaths due to RTCs in the area. 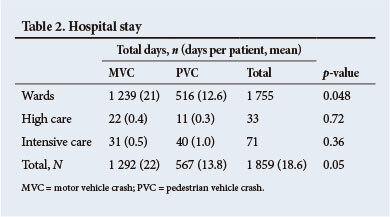 Of the patients admitted, 41 were pedestrians involved in pedestrian vehicle crashes (PVCs) and 59 motor vehicle occupants involved in motor vehicle crashes (MVCs). The majority (n=58) of crashes involved a private vehicle. Only 17% of MVC patients were wearing a seatbelt and 8 were allegedly under the influence of alcohol. On average, RTC patients spent 19 days in hospital and 62 patients required at least 1 operation. 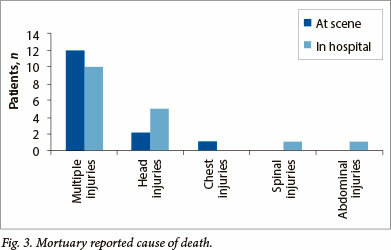 According to our injury pyramid, the number of severe and fatal injuries was higher than in Europe. CONCLUSION: Our results demonstrate a high incidence of RTCs associated with a high injury score and significant morbidity. 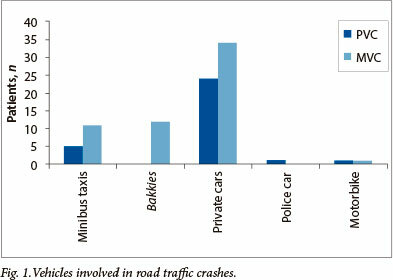 Most crashes were associated with a number of high-risk behaviours. Road traffic crashes (RTCs) are a significant cause of morbidity and mortality globally and in Africa - it is estimated that globally over 1.2 million people die and up to 50 million are injured each year. However, the disease burden is disproportionally distributed, with 90% of deaths and morbidities occurring in low- and middle-income countries where less than half of the world's motor vehicles are owned. As a result of urbanisation and increasing vehicle ownership in developing countries, the magnitude of the problem is set to rise. The World Health Organization (WHO) estimates that by 2020 RTCs will have risen from the 9th to the 5th leading cause of death worldwide. This will place it higher on the list of causes of death than infectious and chronic diseases. South African (SA) traffic statistics show a steadily increasing number of registered vehicles and drivers - with an estimated 13 802 deaths from RTCs in 2011. This is an incidence of 27.5 RTC related deaths per 100 000 population, almost triple that of the USA (10.4/100 000). Our study reviews the burden of RTCs borne by a busy regional hospital in SA. We conducted a prospective study at Edendale Hospital (EH) in Pietermaritzburg over a 10-week period from late 2011 until early 2012. EH is part of a metropolitan complex that includes a tertiary hospital and a district hospital. The complex provides specialised surgical services to approximately 3 million people in the western part of KwaZulu-Natal (KZN) Province. All patients who were seen at EH after a RTC were included in this study. Details for those discharged within 24 hours were taken from outpatient records. Patients who were formally admitted to the wards were interviewed, and their clinical notes reviewed. Once 100 consecutive inpatients had been accrued, the study was closed. A structured interview sheet was used for consistency. All patients who were interviewed gave informed consent. Information sought included: the estimated speed at which the vehicle was travelling, the use of seat belts, the abuse of substances and alcohol, and general information about the nature of the accident. Each of the admitted patients was reviewed clinically by the primary author and followed up for the purposes of the study every 48 hours until discharge. 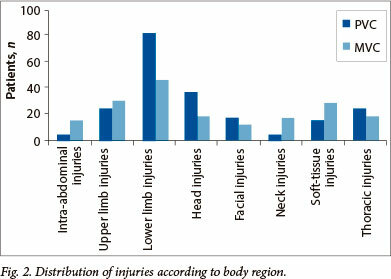 Injury severity scores (ISS) were calculated for all the admitted patients. Data concerning all fatalities from RTCs were sourced for the 10-week period under review from the police mortuary in Pietermaritzburg. Class approval for collection of data relating to trauma patients was given by the Biomedical Research Ethics Committee, University of KZN (ref. no. BE207/09). Of the 305 patients seen over the 10-week period, 100 patients were admitted and 45 fatalities from RTCs were recorded at the police mortuary over the same time period. These included 15 from the scene of the accident, 17 from EH (of whom 4 had been admitted), and 13 from the other two hospitals in the metropolitan complex - the latter were excluded from our study. Thus, 320 RTC patients were included, with an on-scene mortality rate of 5% (15/320) and an overall mortality rate of 10% (32/320). This translates into 5 RTC patients per day and a fatality every second day. Of the 100 patients admitted, 13 were <15 years, and 67 were between 15 - 44 years. Fifty-nine patients were involved in crashes as motor vehicle occupants (MVCs) and 41 as pedestrians (PVCs). The PVC patients were, on average, younger than the MVC patients (p=0.02). The majority of crash patients were male (66%). Table 1 summarises these demographic details. Twenty-five crashes occurred at night and 67 during daylight hours (time of day was not known in 8 cases). There was an equal distribution of PVCs and MVCs. Thirteen pedestrians were crossing the road at the time of the accident, 7 at official pedestrian crossings, and 11 were walking on the side of the road. Of the MVCs, 14 motor vehicle occupants were drivers and 44 were passengers (1 unknown). Only 17% of motor vehicle occupants indicated that they were wearing seatbelts at the time of the accident. In 8 MVCs, the driver was allegedly under the influence of alcohol, 2 admitted to the vehicle being overloaded, 1 driver was unlicensed, 12 were allegedly driving over the speed limit and 13 were driving on wet roads. The majority of the vehicles involved were private motor vehicles, which significantly exceeded the number of commercially operated minibus taxis (Fig. 1). Of note was the high incidence of crashes associated with transporting passengers in the back of an open flatbed truck (bakkie). Of the 197 injuries sustained by the 100 patients, 26 patients had ≥3 injuries. There was no significant difference between PVCs and MVCs in the number of injuries sustained or the ISS (n=13.63 and n=12.37, respectively; p=0.5). The most commonly injured body region was the lower limb, followed by the upper limb (Fig. 2). Surgery was required for 62/100 patients and 90 operations were performed (182 hours of total theatre time) with 15 pedestrians and 17 motor vehicle occupants requiring ≥2 operations. The overall mortality for all RTC patients seen at EH was 5% (17/305), with the mortality for inpatients being 4% (4/100). Injured motor vehicle occupants spent significantly longer times in hospital (Table 2). The cause of death as documented by the police mortuary of patients from EH and from the scene is shown in Fig. 3. 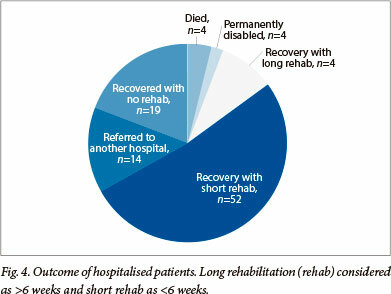 The outcomes of the admitted patients are shown in Fig. 4. Students (n=24) lost an average of 16 days of study and employed patients (n=30) lost an average of 22 days of work due to hospitalisation. Patients were grouped according to injury: minor (not requiring hospital admission), moderate (ISS <15), severe (ISS ≥15) and fatal. 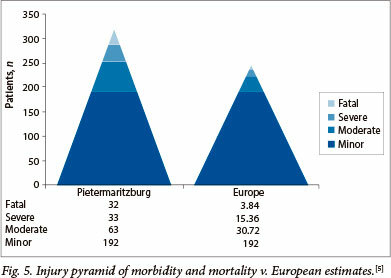 This was compared with the European Commission Injury Pyramid for the European Union (2010) - that for every road traffic fatality there would be 4 patients with severe injuries, 8 patients with moderate injures and 50 patients with minor injuries. The European estimates for the number of more severe injuries were adjusted according to the 192 minor injuries seen in our study (Fig. 5). Our study has shown that there is a high burden of injury associated with RTCs at EH. Extrapolating our data suggests that we should expect 1 664 patients per year, with 520 requiring admission and an estimated 166 deaths. This equates to 5 RTC patients per day and a fatality every second day. This constitutes a significant workload as the majority of patients required at least 1 operation and spent, on average, 3 weeks in hospital. The major burden of this operative load falls on the orthopaedic service. However, the acute general surgical and critical care services also face a significant burden. The economic burden of these crashes to society is difficult to calculate. We have shown that the majority of our patients were male (66%) and of an economically productive age (67%). The estimated loss of income is significant, with the average loss of workdays due to hospitalisation only being 3 weeks. Students involved in RTCs lost >2 weeks of schooling. The injury pyramid created with this data clearly demonstrates the magnitude and severity of the problem of RTCs in our area, especially when compared with data from Europe. With 192 minor injuries seen in a European country, approximately 31 moderate, 15 severe and 4 fatal injuries would be expected. With the same number of minor injuries seen at our hospital we saw 63 moderate, 33 severe and 32 fatal injuries. This suggests that we are seeing far more severe and fatal injuries than in the developed world. There are 3 factors involved in RTCs - human, environmental and vehicle. Problems in each of these areas explain the differences between crashes in the developed and developing world. Human factors are thought to be the predominant causative factor in RTCs in SA (83%) compared with vehicle (9%) and environmental (8%) factors. Our study supports this contention by highlighting a substantial but almost certainly an under-reported incidence of modifiable high-risk behaviour. These high-risk behaviours included speeding (20%), alcohol intoxication (14%), failure to wear seatbelts (17%) and overloading of vehicles (3%). These high-risk behaviours can be modified and it is here that public health programmes need to target their interventions. Effecting behaviour change is difficult, however, and would need to combine an educational programme with punitive legislation designed to enforce compliance with safer road use practices. This legislation also needs to be enforced adequately. Many low-income travellers make use of private minibus taxi services rather than formal municipal bus services or trains as their routine transportation. Studies have shown an increased number of fatalities per crash in SA and other developing countries due to collisions involving vehicles with many passengers, such as buses and bakkies. [6,11]Without the relevant mortality data, we could not demonstrate this but of the admitted patients 27 had been in an accident involving a minibus or bakkie. A study of road vehicles in Gauteng demonstrated that vehicles in SA are commonly not maintained to current safety standards. We can postulate that the widespread use of poorly maintained and serviced, older, second-hand vehicles contributes to the excessive incidence of RTCs in our environment. Our study demonstrates the significant injury burden associated with RTC patients treated at a regional hospital in SA and confirms that the patients are often economically active and that there is a significant loss of economic activity associated with RTCs. We have highlighted the high mortality rate associated with these injuries and demonstrated that there are major modifiable risk factors that contribute to the excessive rate of RTCs. This must be regarded as a major public health problem and the approach must include research at a local and regional level aimed at directing primary prevention strategies to locally relevant risk factors.